A BS 1363 plug has two horizontal, rectangular pins for live and neutral, and above these pins, a larger, vertical pin for an earth connection. Unlike with most other types of sockets, the earth pin is mandatory in the BS 1363 plug, as it is needed to open a shutter in the socket; a safety feature. It also polarises the plug. Moulded plugs for unearthed, double-insulated appliances can substitute this contact with a plastic pin. A fuse is required to protect the flex, as British wiring allows high-current circuits; without the fuse the flex is not considered to be sufficiently protected. Accepted practice is to choose from the commonly available ratings (3 A, 5 A, and 13 A) the smallest rating that will allow for the appliance’s peak power consumption. 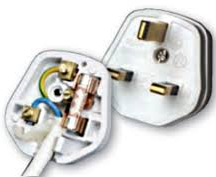 The live and neutral pins on modern plugs have insulated bases to prevent our fingers making contact with the metal of the pin, and also to stop metal from becoming live if lodged between the wall and a partly pulled out plug. A downside to this prong insulation is that it may contribute to damaged sockets not making good contact with the prongs, which may even melt the latter. No such problems exist with healthy sockets, so it’s also beneficial to making sure you keep your sockets in good order. The plug base is broadened near the pins to help keep fingers away from the pins. The plug sides are shaped to improve grip and make it easier to remove the plug from a socket without risking touching the pins. The plug is polarised, so it should always be clear which lead or prong is live. The cable always enters the plug from the bottom, to make it difficult to unplug the plug by tugging on the cable. The design of the earth pin ensures that the earth path is connected before the live, and remains connected after the live is removed. Should the cable be tugged from the plug, the designed lengths of the internal wires should mean that the live wire is disconnected first, followed by the neutral and finally the earth. This ensures that an abused plug will fail safely. Let''s hear it for BS1363!